This past Friday, I received a book I'd been waiting for since mid-April: Berkeleyworks: The Art of Berkeley Breathed: From Bloom County and Beyond. I finished going through the book this morning. Today is a Sunday, and I spent all morning going through illustrations by my favorite comic artist of all time. I felt nostalgic and entranced by new (to me) work at the same time. It left me in a bit of a surreal state, so if this post seems a bit odd, please forgive and indulge me. 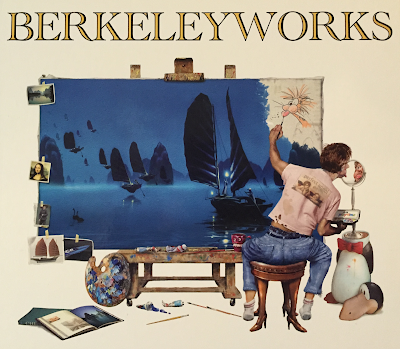 For those of you that are not familiar with Berkeley Breathed or his work, SHAME! SHAME! SHAME! 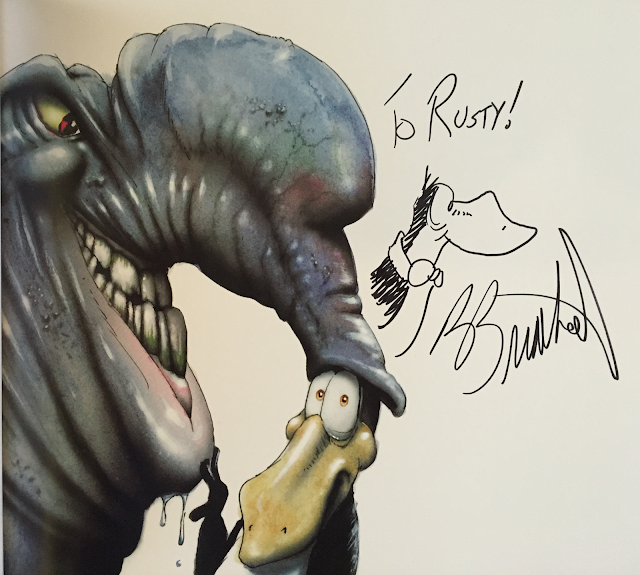 Please have a look at Bloom County (wikipedia), comics, and the Facebook page where new strips are being published. In addition to all of this, Berkeley Breathed has also produced two other comic strips (Outland and Opus) as well as children's books (one of which was made into a movie). There's a lot of material, so take your time. The personalization is what I waited 6 weeks for, as it turns out. WORTH! EVERY! SECOND! Alright, fanboy stuff aside, I am SO glad I saw the blurb for this book and decided to get it. There's so much content in here that touched all the feels, and every page is magnificently done. I never appreciated how good an artist Berke Breathed actually is, staring at black-and-white strips every day during my adolescence. It's the kind of thing that makes me want to develop some skills in drawing *now*, beginning at the tender age of 40-something. One piece in particular made me laugh out loud and wonder if Berke Breathed had somehow looked through my photo albums. On page 203, "Ben" (which I won't reproduce here without permission -- go get the book!) captures two moments from pictures I have of Gabriel as a toddler. In one, he and Garrett are both dressed in bumblebee costumes for Halloween. In another, Gabriel is crying, running away from Lucy, our bassett hound puppy. She was quite energetic and affectionate, and Gabriel didn't like being jumped on and knocked down very much. If you aren't sold on picking up a copy of this book for yourself, then I haven't done a good enough job of describing it to you. I strongly encourage you to get a copy yourself and tell me where all of my descriptive shortcomings are so that I can do better next time. I think it can still be found at IDW Publishing or on Amazon. FYI: the IDW page can be slow to load at times. Be patient with it if you go that route.